GEPL Capital is one of the largest full service broker in India. 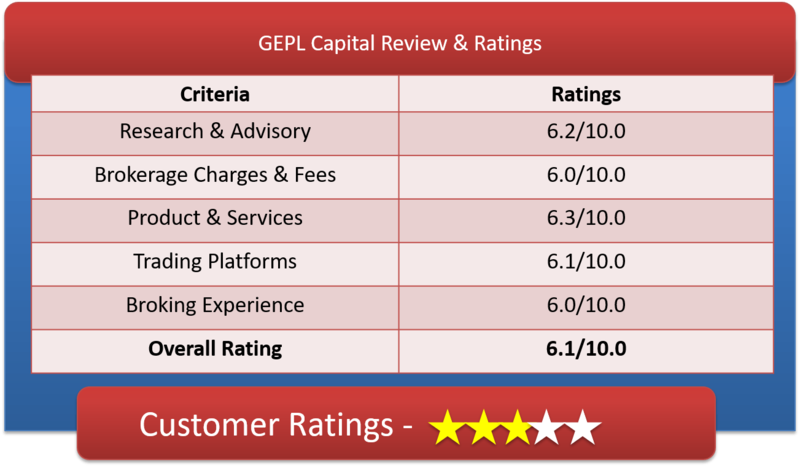 Lets go through a detailed GEPL Capital Review, GEPL Demat Account, GEPL Brokerage Charges, GEPL Trading Platforms & other important features. GEPL CAPITAL is a full-fledged financial services firm. The full service broker is offering brokerage services in Equities, F&O, Commodities. GEPL Capital also helps you with investments like Debt, Insurance and Mutual Funds. Established in 1997, GEPL is headquartered in Mumbai. This Broking company has presence in total of 9 states. They serve through 150 branches spread across these states. GEPL CAPITAL is a depository participant of Central Depository Services Ltd (CDSL). GEPL Online is their online trading platform. It offers trading in Equities, Commodities and F&O for stocks listed on NSE and BSE. The investment is supported by strong research team that undertakes both fundamental and technical research. The company offers wide array of products ranging from corporate fixed deposits, Bonds, NCDs, tax saving bonds, life Insurance and General Insurance, mutual fund investment, IPOs to name a few. Their clients include high net worth individuals, as we as NRI clients. Customer Care is taken care through, e-mail, call and trade, speaking to their individually assigned relationship manager or by visiting one of various branches spread across the country. GEPL Capital also offers commodity trading services through its subsidiary named GEPL Commodities Private Ltd with its membership in NCDEX and MCX. Besides equity broking, GEPL’s services comprises of loan against shares, NRI Services, depository Services. They have a tie up with Bank of India (BOI) for hassle free and seamless trading and fund transfers. GEPL enriches their offerings by providing trading tips and recommendations, research reports, news and alerts. GEPL Capital’s broker charges 0.30% for trading in equity cash, 0.03% for trading in Intraday and Future, which are neither too high nor too complicated. Option trading can be done at Rs35/- per lot. Why Open GEPL Capital Demat Account? Loan against shares facility is available which helps you with financial leg room in tough times. 24×7 Online Back Office Access, so you get heard all the time. GEPL Capital will offer you web based, desktop base and mobile application based trading platform. They have OMNESYS NEST Trader as their platform for trading. The tool is available in all three ways- desktop, web based and mobile application. An software application powered by ‘Omnesys NEST Trader’ can be downloaded easily and installed on your computer for trading. This is a lightning fast platform for execution of orders with real time monitoring. A browser based trading website powered by ‘Omnesys NEST’ comes with almost all the features to trade successfully. The application allows you to trade from their mobile phones on the move as well as access stock market news, currencies, commodities, quotes of NSE & BSE. GEPL has multiple offering. This is keeping in mind every investor their type and trader at a very discounted price. But the broker does have drawbacks in terms of marketing their brand, web site designs, tech tools, etc. and also can work upon it if they really want to compete with the big, full-service brokers. Lack cutting on tools to support trading. No brokerage charge detailed on website.